I'm a writer, by profession and for fun. Here you'll find some of the fun stuff. Took me a while to write novels, but now I've published three of them. I've posted the first chapters of each of the novels, accessible via this page or through these links . . .
Whatever Gods May Be, my first novel, was published by Bold Strokes Books in 2010 and, to my delight, won several awards. These included a 2011 Golden Crown Literary Society Award for Dramatic General Fiction, a Lesbian Fiction Readers Choice Award as one of 2010's five favorite general fiction books, a 2011 LGBT Rainbow Awards Honorable Mention for Best Lesbian Debut Novel. 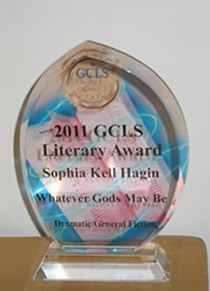 Whatever Gods May Be also a made me 2011 Golden Crown Debut Author finalist. Shadows of Something Real, the sequel to Whatever Gods May Be, arrived in 2013. Omnipotence Enough, which completes what's become known as the Jamie Gwynmorgan series (a trilogy, actually), was published in October 2017. All three of these novels are available from my publisher, Bold Strokes Books, as well as from any bookseller. Several essays which you may, even now, find a bit thought-provoking. I invite you to take a few minutes to roam these pages and, I hope, enjoy what you find. Jamie Gwynmorgan doesn't believe in prayer. She doesn't believe in anything much. Except that people can’t be trusted—certainly not anyone she’s ever met. But Jamie knows some things. From experience. She knows if she died, nobody would give a damn. Nobody would even notice. She knows the better she can fight, the safer she’ll be. That’s why she can’t resist the sleek, dark lethality of the weapon—and the recruiter’s promise that yes, if she’s strong enough, good enough, she’ll get to fire that weapon in combat. She doesn’t care about the uniform. And screw the pretend-camaraderie. Only Safe matters—and if she can do combat, then maybe she can fight her way to Safe. Jamie expects a grueling fight that she might lose. What she never expects is to win love. Whatever Gods May Be is available in print and ebook from Bold Strokes Books or any bookseller. In some ways, Marine Lieutenant Jamie Gwynmorgan has it pretty good. The motherly kindness of Lynn Hillinger, the senator she saved during the war that nearly killed them both, never wavers. Plus she has a great place to stay while she’s on convalescent leave—and a steady supply of the best lemonade on Earth. But flashbacks and nightmares shadow her as she tries to decide: Attempt a return to active duty, or…what? Jamie doubts she can ever achieve the peaceful life she dreams of—until she meets smart, idealistic Adele Sabellius. As their relationship deepens, almost anything seems possible. Soon, however, Jamie learns that something more menacing than nightmares and flashbacks has begun to twist the restless shadows around her. Though she may never understand why Adele loves her, Jamie will do whatever it takes to keep Adele safe when relentless enemies emerge from those darkening shadows to threaten yet another war. Shadows of Something Real is available in print and ebook from Bold Strokes Books or any bookseller. Omnipotence Enough is available in print and ebook from Bold Strokes Books or any bookseller. and it's not okay to steal any of this or send it off to torrent sites, etc.— but what you find here is freely available for your personal reading and viewing enjoyment.